A USA TODAY AND PUBLISHERS WEEKLY BESTSELLER! From the bestselling author of The Good Neighbor and After Nightfall, comes a dazzling new novel of psychological suspense in the vein of The Woman in the Window and The Wife Between Us that questions just how much we can trust the people around us. "AJ Banner's The Twilight Wife is an intensely suspenseful, diamond-sharp romantic thriller about a woman who has lost her memory and the wild, painful path back to her true self. Every page is packed with both peril and exquisite writing, and the novel reads like a wholly unique cross between Somewhere in Time and Memento. You won't be able to put it down!" "After a diving accident, a woman's memory returns in cryptic and terrifying flashes in A. J. Banner's latest thriller. Filled with buried secrets and unexpected turns, The Twilight Wife is a twisty, edge-of-your-seat story that's impossible to put down." "Banner captures the anxiety of a lost memory and haunted past in this taut psychological thriller, beautifully set on a remote island in the Pacific Northwest." "Suspense and mystery simmer on every page of A.J. 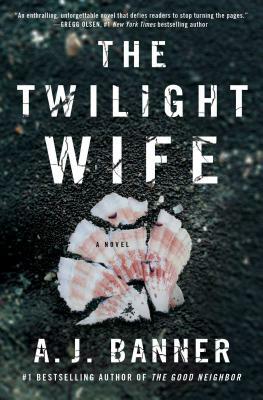 Banner’s latest novel, The Twilight Wife. With a wonderfully clever plot; a sympathetic and skillfully drawn point-of-view character; a powerful sense of place; and rich prose that is, at times, almost hauntingly evocative; The Twilight Wife is everything readers could hope for, whether they are looking for psychological suspense, mystery, or simply a beautifully-told story. A real treat." "A haunting tale about one woman's struggle to remember the past, the husband she is supposed to love, and the accident that changed everything. This mesmerizing fast-paced psychological thriller is full of chilling twists and turns. I couldn't put it down!"